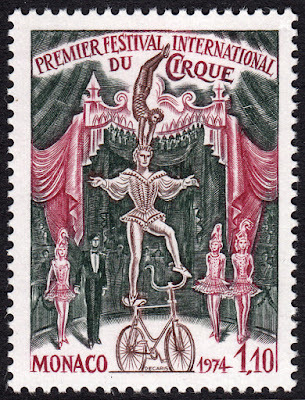 On this day, 6 May, in 1901, the supremely talented Albert Decaris was born in Sotteville-lès-Rouen, France. This year marks the 115th anniversary of his birthday. Over the last couple of days I've spent some time perusing my collection of stamps he engraved, searching for something appropriate to use to celebrate his birthday. 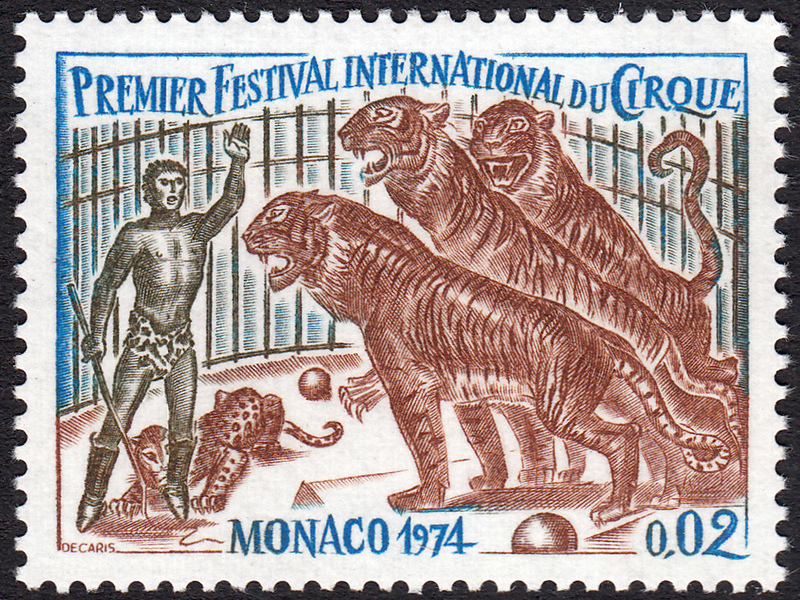 When I turned to my stamps he engraved for Monaco, I came across a set that reminded me of one of my most memorable birthdays when I was a kid. I think it was my tenth or eleventh birthday and I recall being told we were going to visit my grandmother. I always enjoyed seeing my grandmother so I was quite excited by the idea, but little did I know we were going somewhere far more exciting! So I jumped into our car and we started driving. It wasn't long before I knew weren't going to my grandmother's. About a half an hour later my eyes nearly popped out of my head as we pulled up right near a Circus Big Top. That birthday was the best. 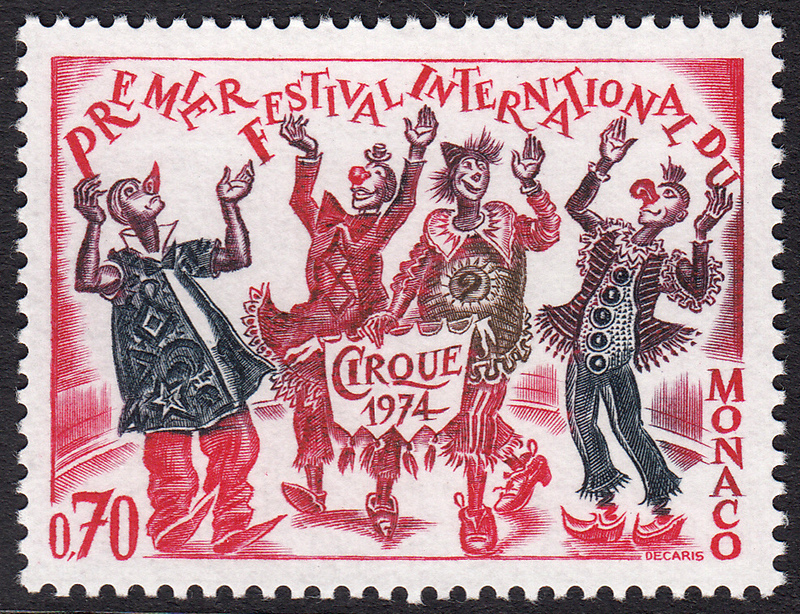 What better way then to celebrate Decaris' birthday but with some circus stamps. 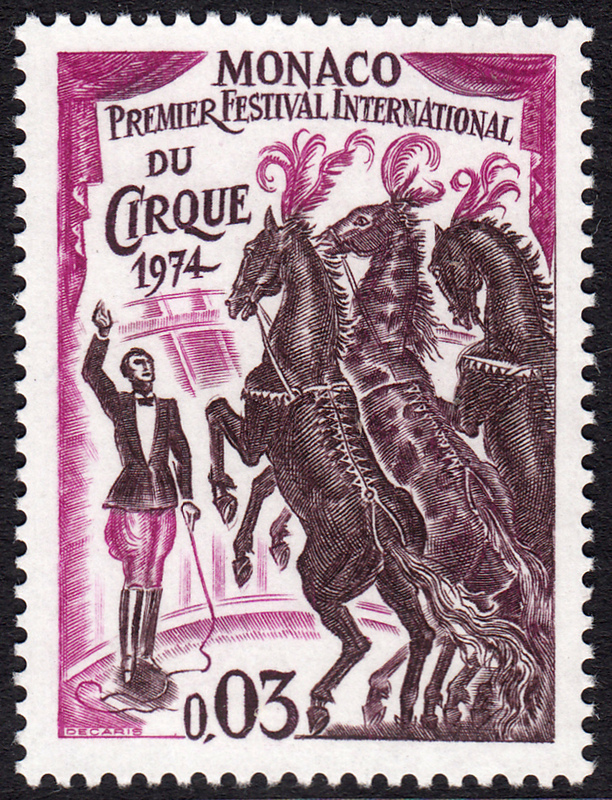 The Premier Festival International du Cirque or International Circus Festival of Monte-Carlo is an annual festival, created in 1974 by Prince Rainier III of Monaco. 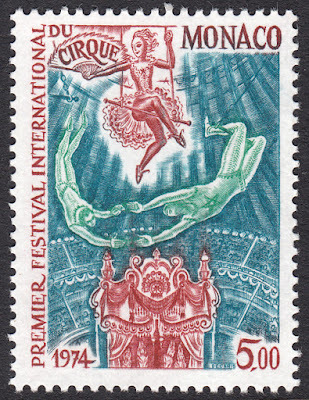 Every January the best circus performers from all over the globe flock to Monte-Carlo to take part in the festival. 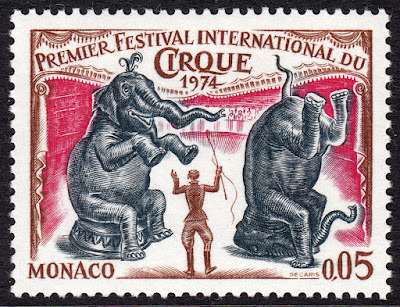 On 12 November 1974, Monaco issued a sumptuous set of seven stamps to celebrate the first year of the International Circus Festival of Monte-Carlo. 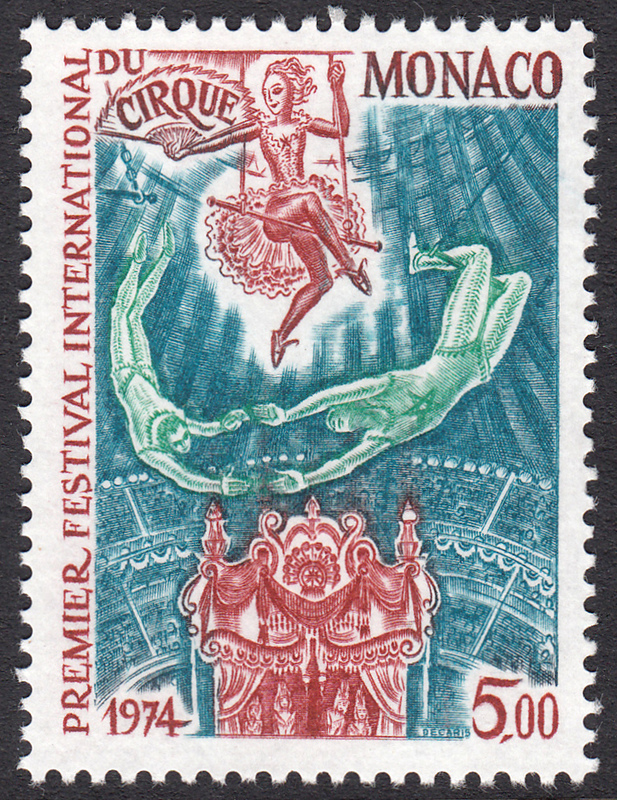 Albert Decaris engraved the stamps and in my humble opinion they are some of the finest stamps he ever produced. The fun and frisky nature of the stamps suit his quirky style to a tee. Roll up! Roll up! The circus has come to town! Can you hear the crack of the whip? The roar of the wild beasts? We know what that means. Enter the brave tamer, decked out in his leopard-skin loin-cloth, working hard to maintain control of a group of tigers. Is that a tiger sneaking up behind him ready to pounce? 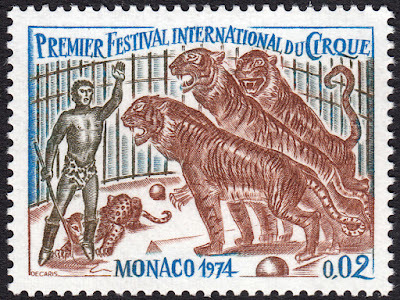 Or is it a bested tiger and an example of what the tamer hopes to achieve with the other three tigers staring him down? The thunk of horse hooves reverberates beneath the Big Top as the prancing horses gallop out and dazzle the crowd with their organised prowess. Such colour. Such beauty. 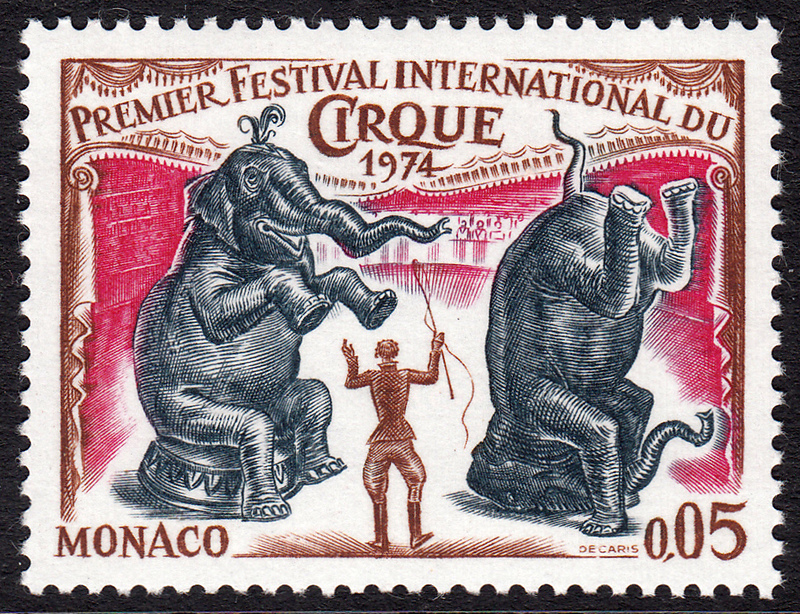 Who doesn't love an acrobatic elephant? Watch these giant lumbering beasts perform staggering feats of balance and control. Take a photo. What a great snapshot! 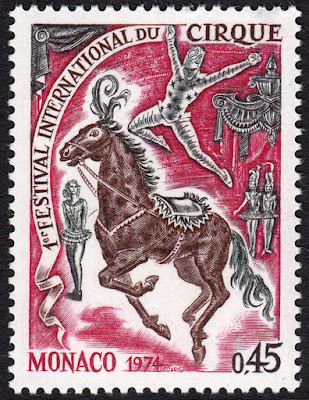 Prepare to be spellbound by the equestrian event. 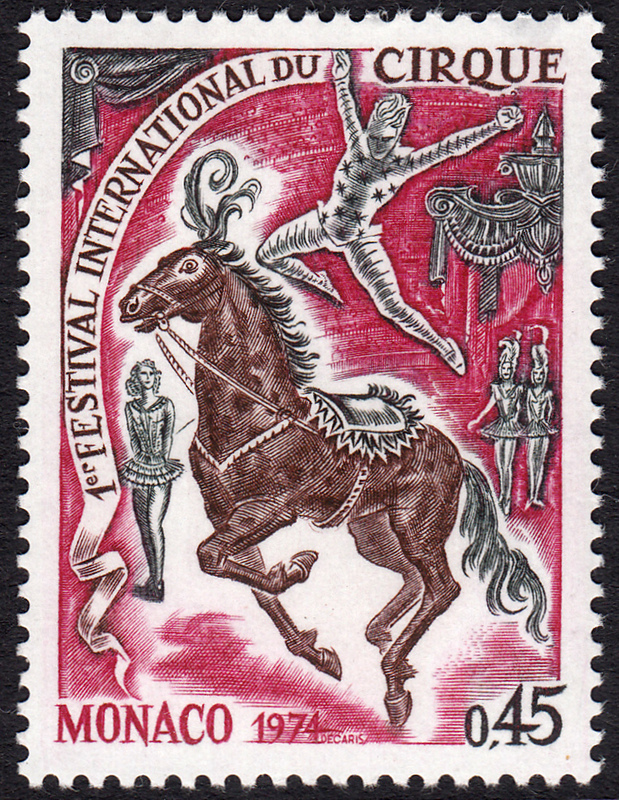 Marvel at the feats of human agility, all while riding upon a horse. And here come the clowns! Laugh yourself silly with their zany, side-splitting antics. And what do we have here? 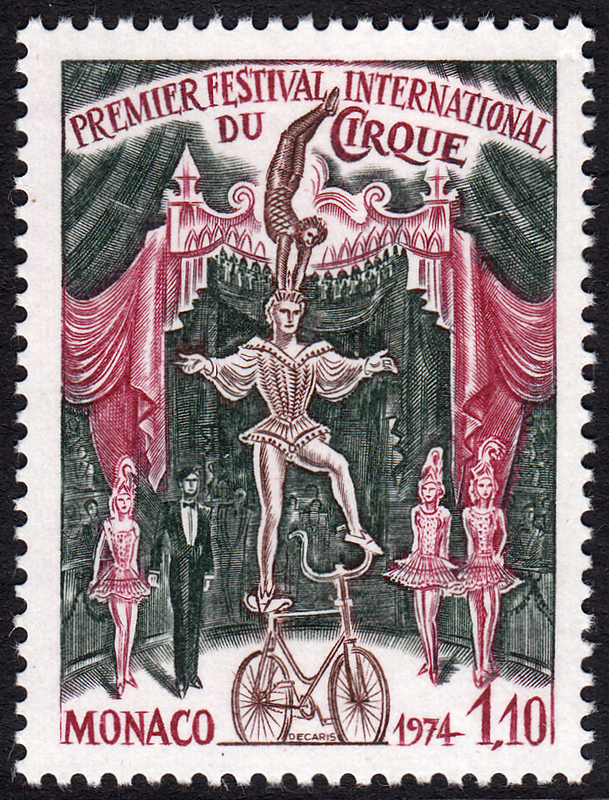 Is that a man standing on a bike with a woman doing a handstand on his head? What masterful balance! Quiet now. We wouldn't want to disturb their concentration. Well, I hope you enjoyed the show! Happy Birthday....what a great time it's been.